Dark Purple flowers that are nearly black on opening with contrasting anthers.Certificate of Merit awarded in 1998 by the British Clematis Society.Romantika is very easy to grow and is a vigorous clematis! 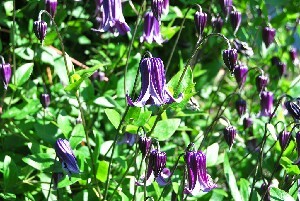 Dark Navy Purple bells. One that always gets noticed in the garden. Blooms in abundance all summer long.Just keep it dead-headed. 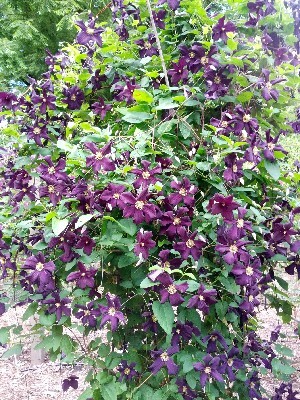 I love this clematis!! Terrible picture of a great clematis. Large Red flowers bore Freely over a long period of time. One of my first to bloom and last to stop. Very hardy and vigorous.Easy to grow.